← New Year’s Resolutions #Giveaway #ChurchDwightValue Winner Is … Is It You? It’s been a long, hard winter, and spring is the perfect opportunity to hit the reset button. Fitness: Tracy will share her favourite get-active tips for the warmer weather. Fitness is one of her passions: on Friday, March 27, Tracy will host a hula-hoop Guinness World Record attempt at Dundas Square in Toronto, with the goal to get as many people as possible hula-hooping as a team to help the city make history as the place that knows how to have fun while staying active. Eating right. Sometimes getting back in shape actually starts with what we eat. A balanced diet gives your body the nutrition it needs, and Tracy has signed on as the ambassador for the Activia Challenge, a special month-long initiative that educates Canadians about the importance of dairy products as recommended by Canada’s Food Guide. Tracy can share her advice for eating right at all times of day and on the go. Begins on: time post goes live and Ends on: whichever comes first: March 25, 2015 at 8 pmEST or first 4 comments posted below! Disclaimer: Activia has provided me with the above-mentioned promotional item(s) for giveaway; I have not been paid for this post. All opinions expressed (if any) are mine alone; positive comments or review is not required. Any information acquired from Activia‘s various social media formats has been authorized, and has been done so as to facilitate my post/review. I’d like to be included. This is wonderful. Can I be included too? Sue, Jackie, Lori, Anne … you are my first 4 entries. Our favourite is vanilla and we add lots of berries to it! Thanks, this sounds pretty cool! 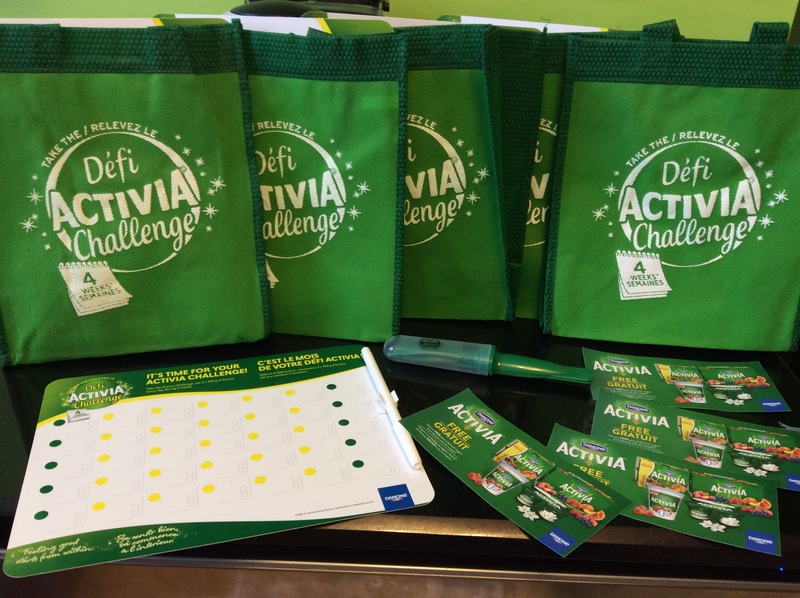 I love Activia and would love a Challenge Kit! Is there something specific we need to comment with? This would be a great opportunity. Great program. Thank you to all who have entered. I have my first four winners: Sue, Jackie, Lori, and Anne. I will be contacted you via email.